Bon Scrapatit Designs: AM I CONFUSING Y'ALL??? WINTER ... SPRING ... WINTER AGAIN!!! AM I CONFUSING Y'ALL??? WINTER ... SPRING ... WINTER AGAIN!!! LOL! Well, perhaps I'm not foolin' y'all but "I" am getting terribly confused!!! NOT! Okay, I must do what I must do. I have FINALLY uploaded *WIN'TREE WEATHER* to my 3Scrapateers' store and I would be rather silly not to tell y'all and to promote it just a WEE bit, right? LOL! I mean after all, my dear friend and colleague, Bonnie, made this BEAUTIFUL "scrapatit" for me to give to y'all and I just cannot let her talent and hard work NOT be seen by y'all!!! THANK YOU Ms. Bonnie!!! You know that I LOVE your creations darlin' and it is from you that I have learned to "stack" in my layouts and my "scrapatits"! You ROCK girlfriend! Oh, Ms. Bonnie has also included directions for those new to digital scrapping on how to use a "scrapatit" (scraplet). An "extra" thank you for your generosity there Bon!!! 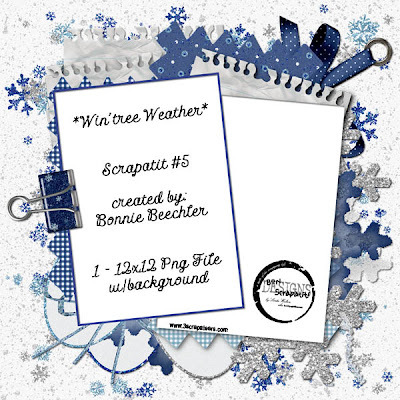 Also, I have included two files, one with Bon's "open" scrapatit (no background) and then I also made one with a background paper from *WIN'TREE WEATHER* for those who might prefer the convenience of not having to look for one to match! So either way, we've got ya covered!!! *WINTREE WEATHER* is done in a palette of blues (my fave since childhood even though I LOVE lots of colors!!! ), silver and white. All of the background papers are my own original designs using brushes and custom shapes, with the exception of the gingham, which were created using a PS style by the VERY talented Ruby Rynne at Brazilian Blend. I have to say that my favorite element creation in this particular scrapkit is, by far, the decorated window with frosted windows! LOL! I wanted to be an interior decorator when I was in junior high school - this was the next best thing!!! I wish I could afford one of those CAD designing programs, but I'd be "out to lunch" forever with one of those in hand!!! And, then, I'd miss y'all WAAAAAAY too much! OMGosh .... I'm digitally daydreaming!!! Get back on track Linda! I have included a BONUS *Glistening Snowflake* alpha with the purchase of *WIN'TREE WEATHER* for a limited time as well as offering it at 50% off during it's introduction through the end of February at ONLY $3.00! What a WONDERFUL start to scrapping some of the WINTER memories you have just created or even some from your past winter memories! You may find the link to purchase located directly beneath the slideshow to your right and near the top of my blog sidebar. As always, I would LOVE to see what y'all create and to display your layouts or other projects in a slideshow here on my blog. My e-mail address is: lindawalton@3scrapateers.com THANK YOU! IT'S SCRAP HAPPY HOUR 24/7 IN SCRAPLAND!!! WOO HOO!! !